You can put all your preconceived notions about music in Brazil to the side now. 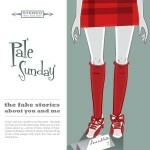 Pale Sunday are nothing like CSS or Bonde Do Role. While I appreciate the regional flavor of those acts, The Fake Stories About You and Me seems so distant; it’s an album of pristine guitar pop in the realm of bands like Lucksmiths or Nada Surf–it’s somewhere in the middle there. It’s a short EP, but “Happy (When You Lived Here)” is perhaps going to be one of my favorite guitar tracks of the year; it’s easiest the best track from the band that I’ve heard to date. Luis’ voice sounds incredible here; it’s calm and cool, yet there’s a smoothness that coincides with the rest of the music. Everyone else’s accompaniment fits perfectly into the track, from the backing vocals to the steady propulsive drum beat. So good; I wish everyone would write tracks like this. “About Your Life” seems a little bit more straightforward in the vein of classic pop songs. The guitars aren’t quite as clean here, and the synths provide an extra element to the background. I can’t quite put my finger on what makes this song so familiar, but I put it all down to Luis Gustavo’s voice. In contrast to the casual cool of the EP’s opener, here he sounds a bit softer, yet more distant in the mix. It might seem like I’m not enthused by the difference, but I assure you that I’m having a hard time not playing this track over and over. Screw it. I’m playing all four songs constantly. Pale Sunday gives a bit of a bouncing drum roll on “That’s the Way,” giving the third track a bit of swagger and swing. It’s a song about getting high with a friend or loved one, feeling lost in an emotional sense. Towards the end of the song it sort of careens with guitar work that sort of bursts into a solo…perhaps providing the listener with that feeling of taking off into the far out realms of one’s mind. When The Fake Stories About You and Me came to a close with “The Winter Song” I was taken aback at first. It’s a song focused on strummed guitar, and a different pop appeal than the previous tracks. For me, it seems a lot more thoughtful, as if the band intended to leave you with a departing note about how we should go on with our lives. I like the way there’s a musical emphasis from the rest of the group that seems to arrive just after the 2 minute mark. It’s a gorgeous track, and one that’s a fitting end to this EP. Just as it ends, you want more, which might be my only detractor here, but with songs this good, Pale Sunday isn’t going anywhere any time soon. I’m grateful for that. The Fake Stories About You and Me is available now from Matinee Recordings. It’s already been a great year for our friends over at Matinee Recordings, having released the new Cats on Fire and several great EPs. And they’re at it again with a new EP from Brazil’s Pale Sunday. The title for the release is The Fake Stories About You and Me, and you can grab it from the label right now. Gentle pop music seems to be the group’s specialty, and you can see similarities to the great Teenage Fanclub, but personally I think that things on this listen are a lot softer–in an endearing way of course. Find yourself falling in love with this new track…it’s easy to do. In an effort to become the only member of ATH with a serious twee addiction, I bring you new tunes from the Brazilian group, Pale Sunday. This is the first new music we’ve gotten from the group since 2005’s Summertime. The warmth of the vocals in this tune, “Shooting Star,” make it perfect for this chilly winter day.